Dislike button option next to Like button available with each statuses, comments, pages, etc. is the most demanded feature by Facebook users since from years in order to show off reaction how many people didn't Liked the shared content. Even some Hackers tried to misuse this demand either to get access or to scrape Facebook users personal data by developing free to download addons and extensions with fake screenshots which claims to a add Dislike feature in Facebook. Checkout following screenshot of similar type of fake add-on for firefox downloaded by more than 21,000 peoples. Now Facebook has released a Dislike icon with a set of new stickers. 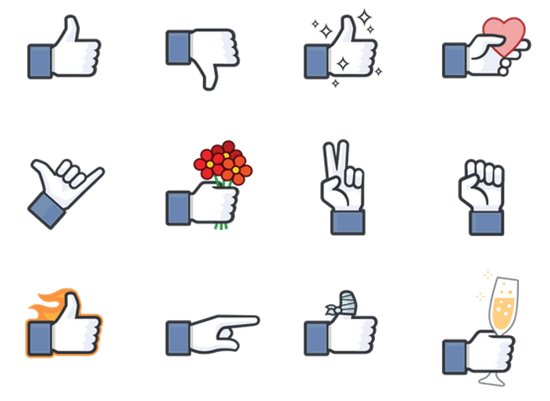 The Likes pack includes a total of twelve Facebook thumbs with variety of styles that allows you give a thumbs up however you like. You can grab these stickers directly from Sticker store. You can use them only in messenger / chat from both mobile and desktop devices. Well currently users can only hope that may be soon Facebook will also release DisLike button feature same like Reddit, YouTube and other sites.